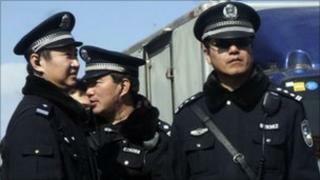 China has mounted a huge security operation in the capital in response to renewed online calls for protests. Anonymous postings had urged people to stroll silently in areas of major cities, as a way of calling for change. The BBC's Damian Grammaticas in Beijing says crowds of shoppers were out but it was not clear if any were protesters. The massive police deployments are being seen as a sign of the Communist Party's nervousness at the civil unrest and revolutions across the Arab world. The security blanket thrown over the parts of Beijing on Sunday afternoon was extraordinary, our correspondent says. This was the third week of calls for protests and the anonymous posts urged people to take a walk through Xidan, a busy shopping area. At Xidan and another shopping area, Wangfujing, there were hundreds of uniformed police; men posted every few yards. Reporters were banned from filming or interviewing anyone. Data signals on mobile phones were blocked and everywhere were huge numbers of plain clothes security men; wearing ear pieces, watching everything, our correspondent reports. Despite the booming economic growth there are millions who feel shut out, angry at official corruption, at inequalities that are rising, at land grabs. That's why the government is so concerned about the possibilities for unrest. He says uniformed police politely checked his identity documents - in contrast to the previous weekend when the BBC team was taken away violently by plain clothes officers. In Zhongguancun near Peking University, police also closed down the subway and mobile phone networks, and police helicopters were reported hovering overhead. Online messages said there may have been a planned gathering of students there. In Shanghai, at least 17 foreign journalists were detained at the protest site, People's Square, for not having permission to be there. Meanwhile, in a more hardline interpretation of current reporting rules, officials said that foreign reporters must seek government permission to conduct interviews in Beijing. At a news conference, Li Honghai, vice-director of Beijing's Foreign Affairs Office, said reporters must apply for government permission before carrying out any news gathering in the city centre. Beijing officials at the briefing denounced the protest calls as an attempt to undermine China's stability. "All clear-minded people will know that these people have chosen the wrong place and have the wrong idea. "The things they want to see take place have not and cannot occur in Beijing," said city government spokeswoman Wang Hui. China's government is aware there are many possible reasons for popular discontent. In his speech at the opening of the annual National People's Congress on Saturday, Premier Wen Jiabao said there were still fundamental issues the government must solve, which he said the masses felt strongly about. Among the issues he listed were inflation, exorbitant house prices, land appropriations and house demolitions by the government and rampant corruption. "We must make improving the people's lives a pivot linking reform, development and stability... and make sure people are content with their lives and jobs, society is tranquil and orderly and the country enjoys long-term peace and stability," Mr Wen said. He made no mention of the unrest in the Middle East.